It’s available from July 20, 2015 to September 30, 2015 Jan. 4, 2016 at MetroPCS stores only, not online. The customer must port a number from a non-T-Mobile network based operator. The phone is free after an instant-rebate of $129, purchaser must pay sales tax if required by state and local laws. Limit of 5 rebates per household. Subject to phone availability, no rain checks. Can’t be combined with Add-A-Line instant rebate or any MetroPCS mail-in rebate. Customer must activate on a $40 or higher plan to get the 1 GB of extra data which they can keep as long as they are an active MetroPCS customer on a non-promotional MetroPCS plan that includes data. The Samsung Galaxy Core Prime is a recently released entry level LTE Android phone with a 4.5 inch 480x800px screen, quad-core 1.2 Ghz Snapdragon 410 processor, 1 GB RAM and 8 GB of internal memory. It has a 5 MP main camera with flash and a 2 MP front-facing camera. 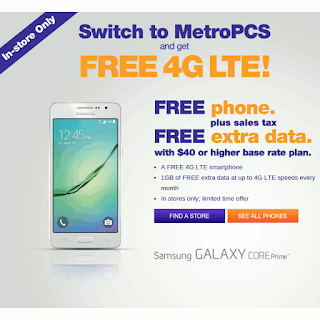 The promotion’s added GB of high speed data gives MetroPCS’ $40 plan 3 GB of high speed data and the $50 plan 5 GB. Both plans also include unlimited talk and messaging and unlimited data throttled to 128 Kbps after the high speed data is used up. There’s a $5/month multi-line discount on each line for accounts with two to five phones. Using the phone as a hotspot is permitted and there are no taxes on MetroPCS plans. Update: The offer has been extended until 1/ 4/16 and the LG Leon and Kyocera Wave have been added to the list of eligible phones. This entry was posted in Mobile Phone. Bookmark the permalink.